It's been ages since I've seen one of these. They are sooo 80's and frightfully retro. A friend of mine and I laughed when we saw it down at Baisikeli. It was like finding an old Duran Duran fan magazine and giggling at the hairdos and clothes. 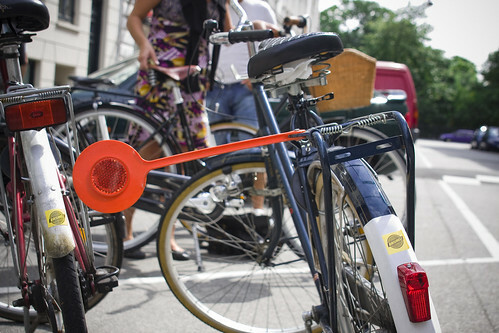 It flips out from your back rack in order to remind cars that they should keep their distance. And you flip it back in when you park it. A little reflector lights up the known universe so you're 'seen'. Another retro feature is this hub cleaner thingy. 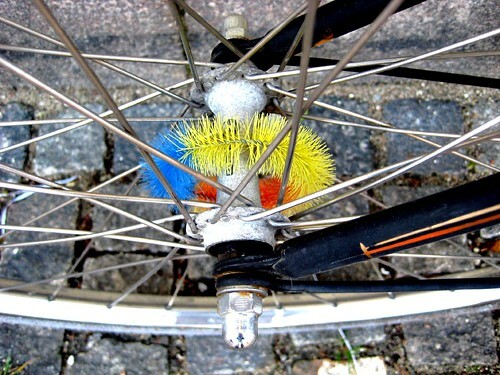 You just put it there and it keeps your hub clear of grease and dirt. Unlike the flip-outy thingy above, you can actually still find these and it's not unusual to see them on bikes around Copenhagen.